Since designing my Rosalind DNA back in summer 2006, I've made six of the things. And given away each and every one of them, I decided it was high time I made one for me (plus it's been featured in WIRED. How can I not have my own version?). I've been talking about it for ages, but was inspired to finally cast on by some of my students, who are currently knitting the history of genetics. The scarf employs a technique called illusion knitting (sometimes know as shadow knitting). When viewed straight on, it just looks like slightly wonky stripes. When viewed from the knitting's edge, however, this wonky-texture reveals itself as carefully placed bumps and gaps, and presents a hidden image. This is a picture taken while I'm wearing it, looking down my front, along the line of the pattern. Illusion knitting is notoriously hard to either describe in words or photograph, so I've embedded a short video. There's another side-view shot at the bottom of this post, along with a picture showing the back of the scarf, where you can see a sort of fossil of the pattern. This is probably the best photo I've seen of this pattern though (i.e. not by me, and using a better contrasting set of yarns). DNA and illusion knitting could be made for one another. Looking across the scarf, the ladders of the striping pattern twist round those of the helix as purls and knits start to bunch together to display a regular shape (at least for those initiated on how to look). The pattern's title is inspired by Rosalind Franklin (google it), and, because I thought a family reference would be appropriate, a cousin of mine. I think my favourite illusion knitting pattern is the Cheshire Cat 'Wonderland' socks. I love illusion socks. Straight on, and it's just stripy, point your toes and the cat is revealed. With valentines soon upon us, I should probably mention the lovemeknot socks too. 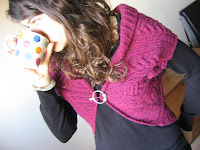 The Rosalind pattern is available for download on ravelry - or through googledocs (though if you are a knitter and read blogs, er, why aren't you on ravelry?). Knit-geeks who want details of yarn, pattern mods and needles can also check the project's ravelry page.